The Luverne City Hall is located at 305 East Luverne Street, Luverne MN 56156; phone: 507-449-2388. Photo: Pierce J. Kniss House, ca. 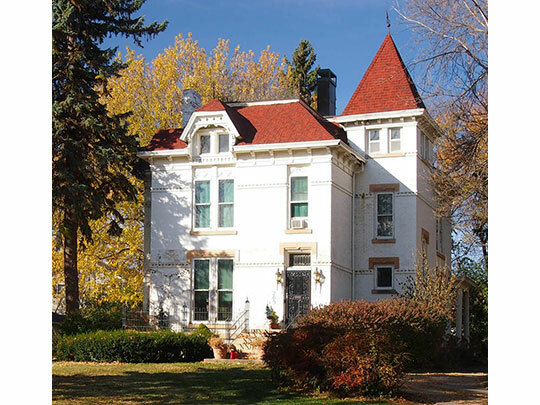 1878, 209 North Estey Street, Luverne, MN. Listed on the National Register of Historic Places in 1980. Photographed by user:McGhiever (own work), 2012, [cc-by-3.0 (creativecommons.org/licenses/by/3.0)], via Wikimedia Commons, accessed May, 2014. Luverne, the county seat, first settled in 1867-68, platted as a village in 1870, was incorporated by a legislative act February 14, 1877, and by vote of its people November 12, 1878. Nearly twenty-six years later, on September 7, 1904, it was organized as a city. This name was adopted for the post office in the winter of 1868, being in honor of Eva Luverne Hawes, the eldest daughter of the first settler here, Philo Hawes. She was born at Cannon Falls in Goodhue county, November 14, 1857; accompanied her parents to the Rock river home in 1868; was married to P. F. Kelley, September 5, 1876; and died in Luverne, June 9, 1881. In the early years the name was spelled as two words, Lu Verne, "but the style was gradually replaced by the present form." The personal name was found in a novel or romance, then probably a new book or published in a magazine, which was read by Philo Hawes' cousin, Lucy Cotter, of Red Wing, at whose request the baby Luverne was so named. As her father and mother are also honored by the name of the village and city, this notice may desirably add that he was born in Danby, N. Y., December 18, 1830, and died at Luverne, August 10, 1908. He came to Minnesota in 1853; served as second lieutenant in the Eleventh Minnesota regiment in the civil war; was a mail-carrier in 1867 between Blue Earth, Minn., and Yankton, Dakota territory; settled on the site of Luverne in March, 1868; was chairman of the board of county commissioners, 1871-73; was postmaster of Luverne, 1871-74 and 1888-93; and engaged in real estate and insurance business.